We have been motivated to write about possible futures in Anthropocene Society because of our dire realization that humankind has entered a new period (the Anthropocene), one where environmental shifts may overwhelm our civilizing efforts on this planet. To us and many in the academic community, it is clear that humans are a key source of this shift and that focusing on just climate change is insufficient for capturing the pervasive and deep change effects manifest in biodiversity decreases, habitat loss, and rising ambient pollution. The Anthropocene is a completely new context for research on organizations and the natural environment. In our article (and related book), we have tried to ask “what will Anthropocene Society look like if we do – or do not – respond?” We use an institutional lens to answer this question and derive four different scenarios for Anthropocene Society’s future: collapsing systems, market rules, technological fix, and cultural re-enlightenment. In each, we see a very different cultural and political reality in organizational fields and logics, our units of analysis. Who has voice in articulating our challenges and potential solutions, and what values or “logics” do these people and groups bring to bear for explaining our changing biophysical reality? Fields may become chaotic and poorly coordinated by institutions, with inequities growing rapidly, or there may be efforts to stabilize certain domains (key markets, such as stock markets or commodity exchanges) or to employ engineering solutions to certain areas (like flooding in Florida or geo-engineering the atmosphere). However, ideally, a more mindful approach to change and adaptation would be taken, one based on re-oriented values that embrace principles of more thoughtful and limited consumption, better distribution, and the creation of more culturally enriched communities. The tensions that we see in the Anthropocene and the organizations in Anthropocene Society are ones that we wrestle with in our research. Individually and jointly, we oscillate between more dystopian and utopian visions of the future; we have documented more skeptical and more progressive actions in climate change fields; we have read the tea leaves of climate events and have seen more mishaps and community hardship, but we also see fantastic efforts of survival and solidarity. Humans certainly have the capacity to respond to these unprecedented challenges, as we did with reversing ozone depletion. But future adaptations will depend on institutional and cultural processes. Our exploration, in turn, offers us an opportunity to reexamine some basic tenets of institutional theory, thereby bringing them more closely in line with our changing bio-physical reality. And in the final analysis, our examination seeks to answer Max Weber’s call to bridge the philosophical divide between physical science and social science – e.g., between Naturwissenshaten and Kulturwissenshaften – where nature is understood through the cultural lens of society, not separate from it. In the #OSEditorPicks for November, Moving Institutional Logics Forward: Emotion and Meaningful Material Practice. Organization Studies, Roger Friedland writes about institutions and emotions. If you are engaged with the literature on institutional logics, here is a new article that you really need to read. As part of a forthcoming Special Issue of Organization Studies, Roger Friedland has written a thought-provoking essay explaining his thoughts about how emotion can be positioned in an institutional logics approach. I believe that this article will stimulate lots of ongoing discussion about emotion and logics. I encourage you to read it so that you can be part of the debate! Institutional theory, and the institutional logics approach in particular, lacks the feelings that produce, sustain and disrupt institutional practice. This is due in part to rational, instrumental understandings of the individual in practice, and in part to the cognitive and linguistic understanding of that practice, sustained by classification, qualification and belief. Emotion, a joining of language and bodily affect, is ready at hand for institutional theory. There is increasing recognition that emotion is a powerful device for institutionalization and de-institutionalization. In this essay, I consider emotion’s position in institutional theory and how we might position it in an institutional logics approach. I will argue that emotion not only mediates institutions, but can itself be institutional. You can read Moving Institutional Logics Forward: Emotion and Meaningful Material Practice. Organization Studies by Roger Friedland free for the next 30 days. In the #OSEditorPicks for August, Behind Smoke and Mirrors: A Political Approach to Decoupling, Anja Kern, Aziza Laguecir, and Bernard Leca respond to calls for more attention to power and politics within institutional theory. They conducted an in-depth study of policy implementation by a Regional Health Authority (RHA) in a French Hospital, and found different patterns of response between surgeons and cardiologists. Surgeons used their sources of power to openly reject the proposed casemix approach. Cardiologists engaged in means/ends decoupling to implement casemix as a way to improve their own interests. Ultimately, the RHA acquiesced to the powerful surgeons and renounced their previous decision to base funding on casemix performance at the clinical level. The authors draw on power dependency theory to explain different types of decoupling that occurred and different ways in which power and politics played out for each group. I am intrigued with this article for a couple of reasons. First, it is great to see an empirical article that brings power and politics back into institutional theory by revealing important aspects of decoupling. Such an approach is long overdue. Second, this article reminds me of Selznick’s detailed and fascinating account of institutional change in the Tennessee Valley Authority (1949). Kern, Laguecir and Leca tell a similarly captivating story that holds twists and turns, highlighting the ways that people can act in pursuit of their own interests. I believe that this article holds real value, and I encourage people interested in processes of institutional change to read it. You can read Behind Smoke and Mirrors: A Political Approach to Decoupling by Anja Kern, Aziza Laguecir, and Bernard Leca free for the next 30 days. This paper examines how entrepreneurs operating in underground markets come to see laws governing marketing systems as illegitimate and explores the role identity plays in motivating entrepreneurs to challenge existing institutions. Analysis of interviews with 27 cannabis dispensary founders showed that entrepreneurs came to reject medical cannabis prohibition as illegitimate after direct experience with both cannabis and traditional medicines convinced them the factual basis upon which prohibition rested was flawed. Perception of prohibition’s illegitimacy fostered entrepreneur identification as a member of a superior in-group constrained by an illegitimate institution. Pursuing opportunities in illegal markets then became a vehicle for entrepreneurs to enact valued identities by challenging and undermining prohibition. This analysis extends work on informal economy entrepreneurship by showing that dis-identification with formal institutions does more than enable entrepreneurs to recognize economic opportunities ignored by those working within institutional boundaries; it also opens existing marketing systems to decay by providing economic and psychological resources for dismantling the laws that govern them. You can read “Entrepreneurship, Identity, and the Transformation of Marketing Systems: Medical Cannabis in California” from Journal of Macromarketing free for the next two weeks by clicking here. Want to know all about the latest research from Journal of Macromarketing? Click here to sign up for e-alerts! The September Issue of Administrative Science Quarterly is Now Online! The September issue of Administrative Science Quarterly is now available and can be read online for free for the next 30 days. 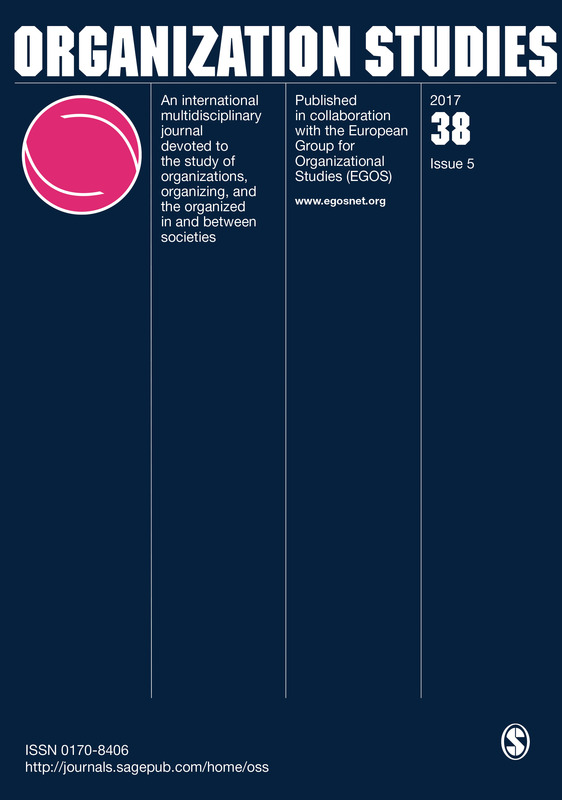 This issue offers a range of astute articles on organizational studies as well as insightful book reviews. The places in which organizational life occurs can have profound impacts on actors, actions, and outcomes but are largely ignored in organizational research. Drawing on ideas from social geography, we explore the roles that places play in institutional work. The context for our study is the domain of housing for the hard-to-house, within which we conducted two qualitative case studies: the establishment of Canada’s first residential and day-care facility for people living with HIV/AIDS, and the creation of a municipal program to provide temporary overnight accommodation for homeless people in local churches. In examining these cases, we found that places played three key roles: places contained, mediated, and complicated institutional work. Each of these roles was associated with a distinct ontology of place: places as social enclosures, as signifiers, and as practical objects. Our findings have significant implications for how we understand the relationship between location and organizations and allow us to develop a process model of places, institutions, and institutional work. Click here to access the Table of Contents of the September issue of Administrative Science Quarterly. Want to know about all the latest from Administrative Science Quarterly? Click here to sign up for e-alerts! “Property Rights Design and Market Process: Implications for Market Theory, Marketing Theory, and S-D Logic” was recently published in Online First in Journal of Macromarketing by Michaela Haase and Michael Kleinaltenkamp, both of Freie Universitat. Professor Kleinaltenkamp discusses the article below. Scholars interested in the fields of marketing theory and market theory; preconditions and modes of resource integration; interdisciplinary research at the intersection of law, economics, marketing and other disciplines; institutional economics and institutional sociology. We were interested in how property rights based analyses can inform service-dominant logic and vice versa. In marketing theory, we have worked on resource integration and the collaboration of the customer in this regard. In service-dominant logic, there is a comparative focus on resource integration and value co-creation. Without the property rights to resources, no service can be exchanged for service. The provision of service depends on the respective property rights bundle held by an economic actor. This study developed its arguments theoretically; there was therefore no basis for surprises which could result from a comparison of theoretical and evidence-based sentences. The analysis of property rights arrangements leads directly to the study of contracts and thus to a research program at the intersection of economics, law, and other disciplines. We think that this study is part of the development of a property rights-based or contractual approach to marketing. It will hopefully be the beginning of further theoretical and empirical analyses on the relevance of ownership and contractual design for the analysis and making of markets. The study draws on several strands of theory building in market and marketing theory which are a source of the resources-processes-outcomes (RPO) approach to the German theory of the firm. The RPO approach identifies three dimensions of a transaction: information, the integration of resources stemming from both parties to a transaction, and property rights. Although no resources can be integrated without having the property rights to them, and ownership as well as non-ownership of resources opens up different opportunities to economic activity, this field of analysis is still rather under-researched in marketing. The rental-access approach by Christopher Lovelock and Everett Gummesson has addressed the relevance of ownership or non-ownership, respectively, for the characterization of transactions and the understanding of market offerings. Although they did not refer to property rights theory in their analysis they highlighted the distinction between ownership and non-ownership and paved thus the way for our distinction between exchange type I and II. Austrian market process theory is another theoretical source of our paper. It emphasizes the relevance of human action and learning processes for the understanding of the market process. Service and the improvement of the actors’s abilities to provide service – learning – is related to this dynamic perspective. The paper has gained a lot from the comments of our reviewers and the editing work by Steve Vargo. We guess we have built our theoretical study on sound sources which need no change at the actual point of time.